Jeanette is a dear blogger friend and she’s been featured here a few times. Glad to have her back as part of the Gluten Free All Star program! Hi everyone, I’m Jeanette from Jeanette’s Healthy Living! Thanks so much, Carolyn, for hosting me on All Day I Dream About Food, as part of the 2012 Gluten-Free All-Star Recipes event. 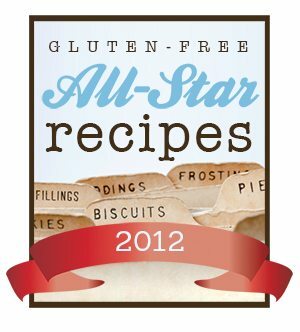 What a fun way to see the best of the best gluten-free recipes for 2012 from a fabulous group of bloggers! I started Jeanette’s Healthy Living 2 1/2 years ago as a place to record recipes I was making for friends with cancer. In December 2010, our youngest son was found to have food allergies and I began chronicling my journey to learn how to cook and bake gluten-free for my son. At first, I was at a loss at how to make his favorite meals free of the foods he was allergic to. Through an elimination diet, we were able to heal my son’s gut and today, he is only gluten-free. Thanks to Lexie’s Kitchen and other gluten-free blogs like All Day I Dream About Food, I can now cook and bake gluten-free easily (most of the time). I try to cook as healthy as I can for my family, but never sacrifice on flavor. My motto is that everything I make has to taste great. 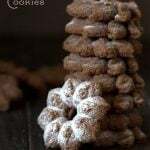 I’m always trying out new recipes and cuisines on my family, so you’ll find all sorts of gluten-free recipes on my blog – North American, South American, Asian, European, and African. In fact, I’ve found it much easier to cook gluten-free because I have learned how to cook different cuisines that are naturally gluten-free. 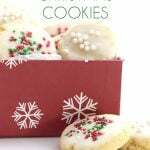 Before revealing the 2012 Gluten-Free All-Star Recipes from my site, I want to highlight an all-star blogger and recipe that quickly became a family favorite in 2012. It’s decadent, but perfect for a special occasion and lighter than you might expect – Chef Dennis’ Spaghetti Fresca with Jumbo Lump Crab (served over gluten-free pasta of course!). It’s also very easy to make and doesn’t require a lot of ingredients. I’ve adapted this recipe slightly to make it saucier by adding more tomato and stretching the crabmeat (I use a 1-pound can from Costco’s for 4-5 servings). This has become our kid’s favorite 2012 celebratory dish and would be perfect for New Year’s Eve. It’s also perfect for anyone who is dairy-free and egg-free. Given how decadent crab is, I love how light this recipe is. 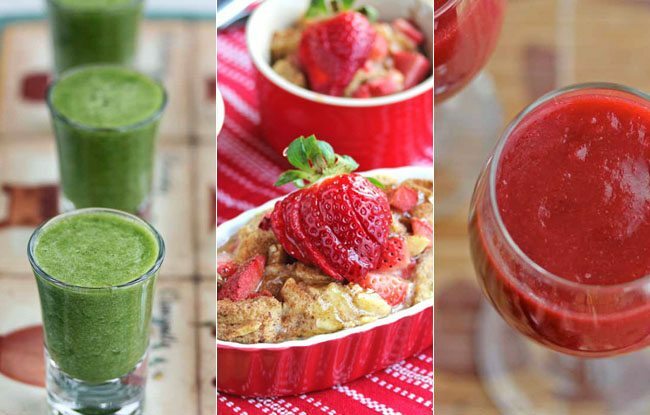 Now for the drumroll…This year the top three honors at Jeanette’s Healthy Living go to Beginner Green Tea Smoothie, Detox Beet and Carrot Smoothie, and Strawberry Banana French Toast Casserole. Interestingly enough, two of my most popular recipes are for smoothies. These smoothie are so good for you, so I’m glad to see that they garnered so much interest. I know they’ll be a great way to kick-start the New Year! 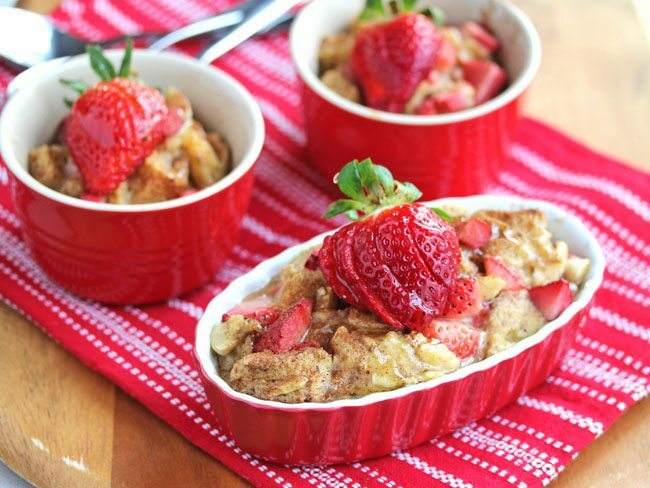 I’m not at all surprised that the Strawberry Banana French Toast Casserole made the top 3 as it is a favorite in our house, easy to make, and so naturally beautiful. 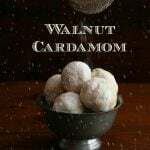 I posted this recipe at the beginning of the year when everyone (including me) was coming off all the celebratory eating from the holidays, and ready to detoxify their bodies. 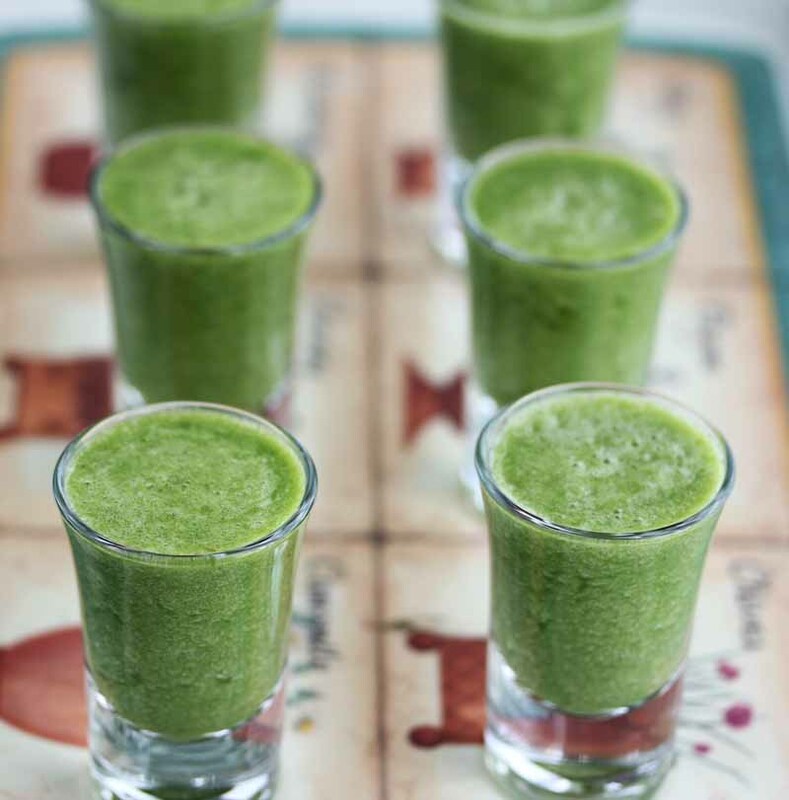 I think people were especially drawn to this Beginner Green Smoothie because I served it in shot glasses. It was a great way to get my kids (and adults alike) to try a green smoothie. Here is the recipe. 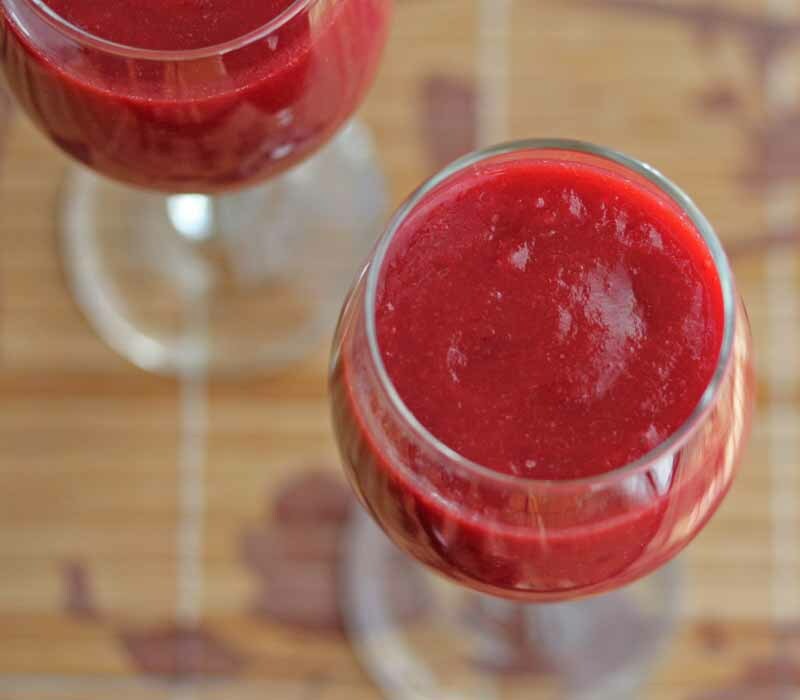 This red smoothie is a tease because it is so vibrant in color and looks like it’s going to taste like strawberries. I posted this smoothie recipe at the beginning of the year when I was trying to incorporate more vegetables at breakfast time. It is such a brilliant red color that my husband thought it was a strawberry smoothie. He drank it all, then looked at me with a puzzled face, wondering what was in the smoothie. I had “tricked him” into drinking something healthy – ha! I first made this pretty French toast casserole for my kids after one of my sons had his wisdom teeth pulled and I wanted to make something soft and special. It’s a great way to get kids to eat fruit at breakfast time, and it’s really easy to make. One father wrote: “This is awesome!! My son and I made for my wife for Mother’s day. 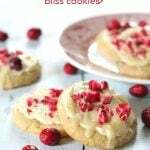 Easy to make and tastes great! Thanks for the recipe.” Here is the recipe. I hope you enjoyed my 2012 Top Recipes. 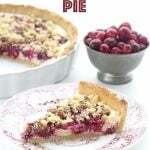 Please pop over to Jeanette’s Healthy Living and check out more recipes. 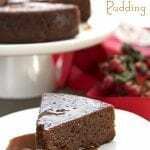 I have lots of recipes focused on whole food living, all family tested. See what Jeanette is up to on Pinterest, Facebook, and Google+. You can also sign up for her weekly emails so you don’t miss out on any recipes. 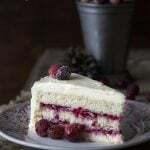 Thanks so much for featuring my top 2012 recipes Carolyn – it’s been really nice getting to know you better this past year and looking forward to seeing all the great things you are up to in 2013. Happy New Year!